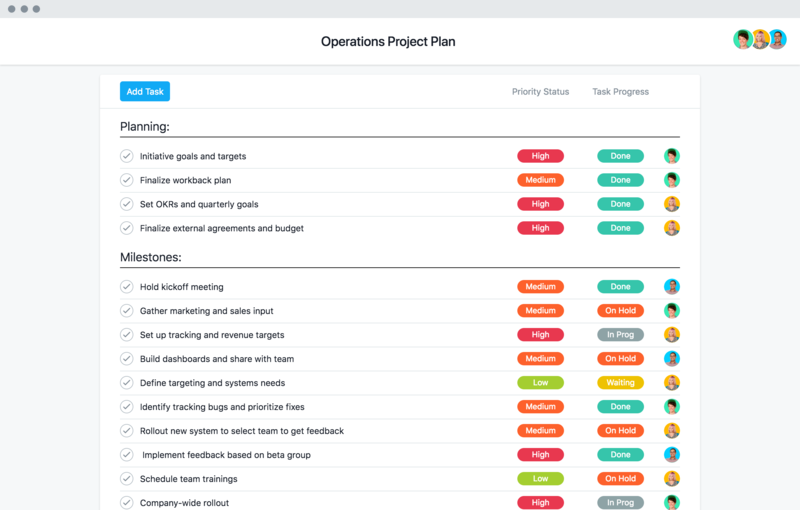 Operations teams strive to optimize and gain efficiency across the business, and can do the same for their own projects with our template. Templatize recurring work. Asana makes it easy to document processes. Then when you’re ready to get to work, you know you’re following the right steps, and can turn your plan into action with a few clicks. Streamline communication. Working across teams and vendors makes it easy to lose track of conversations or waste time managing them via email. Asana keeps questions and conversations in context with work. Keep everyone accountable. Make it clear who’s doing what by when, and keep important documents and expectations all in one place. Shift gears when plans change. Even the perfect plan might need to be optimized along the way. Visualize all your to-dos on a calendar—and easily move them around if plans change without slowing down. How Air France shaved months off of an 11,000-task accounting project and continues to optimize. Ops teams know the challenges of cross-functional collaboration... here’s how to solve them. Tracking processes in a pipeline? If your work moves in stages, here's how you can move work from start to finish.